About a week and a half ago, Camille and I came up with the idea of redoing our friends bedroom, who was going through some hard times. Conviently she was going on a cruise with some of her family and was going to be gone for 5 days. For the past few weeks she kept mentioning that she wanted to redo her room in yellow and gray. Now or never was our thought....so we put a facebook message to some other neighbors and April's family to see if they'd be willing to chip in $10-$20 to our makeover fund. We got a great reponse, so I got online and ordered some fabric. Let's just say I had about 20-25 girls from our neighborhood and April's family that wanted to help or contribute! Here is her room AFTER...... I made myself jealous! I wanted it to be my new room! About a week before we decided to do this makeover, Camille and I were running laps around our neighborhood and saw these two beaten up end tables on the curb. We talked...oh those could be cute, but we don't need them. A week later.....now we need end tables for April's room! In my mind I was thinking they would be the perfect scale for her bed, which sits pretty low. So I called my other running partner that lives on the north end of the neighborhood to see if by chance they were still sitting out on the curb. She ran out to check...they are still there, but someone put them in the trash can. I swung by and picked up Camille and we rescued the ugly end tables from the trash. Some of the girls came to help sand, primer and paint the end tables yellow. They have spray can primer! It worked out great! Then we painted them a mustard yellow color. Of course we needed some "Man work" done, so I recruited Heber (my husband) and Camille's husband. They were awesome...they hung our old door that we were going to use as a headboard, reinstalled the curtain rod, which was pulling out of the wall, and hung the old window above the headboard. I know they hate doing this type of stuff...but they didn't complain at all. The curtain rod needed to be fixed...I had them extend the right bracket further outside the window, so the curtains hang more on the side of the window and make the window look bigger. After we got everything installed and the bed made...we had lots of neighbors that came to help clean, to make it look nice for when April got home from her cruise. Lots of cars out front! Cariann even showed up with a carpet cleaner! As a finishing touch, we needed something to hang over the dresser. I had an old frame that was pulling apart on the bottom corner because the boys knocked it off my wall a few years ago. Andrea from poppies at play blog lives in our neighborhood and is awesome with wood, so she came and grabbed the frame and fixed it for us. A bunch of the girls cut out magazine words that described April and we made a collage for the frame. 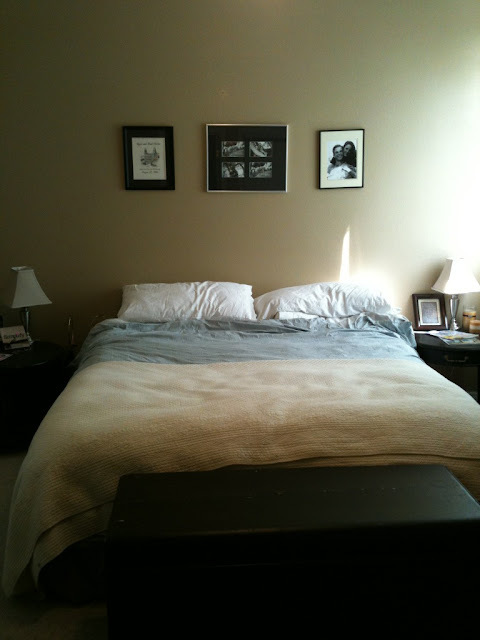 Here is another shot of the bed. I ordered the gray zigzag (chevron fabric) from http://www.fabricguru.com/ for $8/yd and made it into king size pillow shams. I decided no piping to make them feel more modern. I made the gray duvet from two flat sheets from Walmart ($17 each). The bird fabric and all the footwarmer fabrics were generously donated by one of my clients...she had already made what she needed to and gave me all her scraps and extras. My neighbor Becky donated the lamp bases (she didn't need them anymore) and I found the BEAUTIFUL lamp shades at Target ($25 each)...dark gray rouched fabric. I left the original hardware on the endtables. I found the door on KSL.com for $40. I loved the hardware on the door and decided to show it off. The window was hanging in her daughters room, we decided we needed it more than she did. Close up of end table... We were thinking of rubbing some stain on it, or antiquing it...but after we painted it and saw how beautiful it was we change our minds and left it alone. Loving all the fabrics together! For the end of the bed, I wanted a bench of some sort. I scoured http://www.ksl.com/ classifieds and found these two identical matching ottomans for $20 each. I slipcovered them in some gray chenille fabric, and left the legs alone. 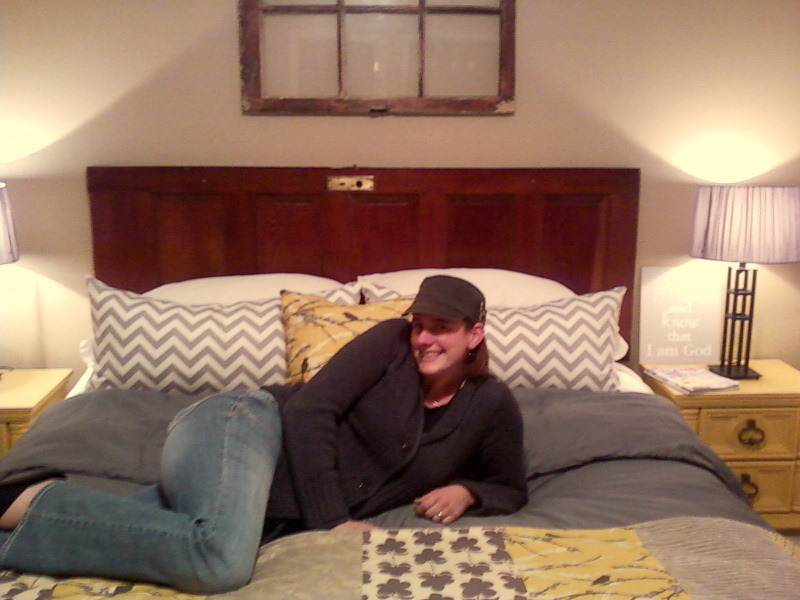 I liked the wood color on the legs to tie in the headboard, window, and dresser. Footwarmer....my son Carter helped me lay out all the fabric squares and made the pattern random. He even helped me sew the squares together. Here is the collage we put together. This picture was taken with my phone right after we set up... not the best quality but you can see everything. My camera lens is a really tight lens and I couldn't get far enough away to show everything in the same pic. We were still trying to locate another lightbulb for the second lamp. We pulled this together in 6 days! Camille, Teresa and I had to leave early Friday morning and drive to Vegas to run in the Ragnar Relay and April wasn't getting home till late Friday night. We were going to miss the big surprise reveal. A few of the other girls showed up and hid behind the bed and in the closet, waiting for April's arrival. They even video taped her reaction for us, since we couldn't be there. While we were on the race chilling in the van waiting for our turn to run our night leg, they texted us this picture of April on her new bed! Love this girl and all the girls that chipped in and helped! Eagle Mountain, UT is an awesome place to live! Aw! Great job! I love the colors! I was in Arizona for my grandmother's 90th or I soooo would've been out painting with you! You're a fabulous friend, Shell. We love you! Wow! April has some great friends! This room looks awesome! Wow! What great friends you all are. I absolutely love the grey and yellow colour scheme. The results are stunning. How sweet! You did a great job. But it really wouldn't matter, cause the love was what counted! That is soo great!! you guys are amazing! isn't funny when you do stuff for others, it turns out super amazing! i love it!! You are such a sweetie!!!!! You are all such good folks for doing this for her. So glad to know that there are people like you and all the neighbors out there. I am sure you all got just as much out of it that April did. It looks awesome!!! What a great thing you all did! Looks fabulous! waaaa! i want to move to utah!!! AHHHH-mazin'. and the room looks fab, too! Holy cow! There are so many things about this post that I love! First, the decor is ah-mazing. I am currently re-doing my room in these colors, and I just found a whole bunch of inspiration here! Thank you! Also, I loved this story, how you got the whole neighborhood involved to help your friend. It was so fun to read about this. I'm so glad you shared. I found you from TT&J. 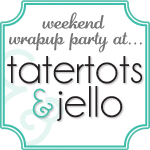 If you'd ever like to stop by my link party, I would be thrilled to have you!!! It's going on right now. It's called Once Upon a Weekend, at Family Ever After, and goes up Friday night. Did you mount the headboard to the wall? I have been wanting to use a door as a headboard and would love to know how you made it! What an amazing job you all did!! I bet she was speechless when she saw it. It all came together so well, no wonder we're all jealous!! You are a fantastic friend!! Wow-what great friends you are-I'm your newest follower-stop by for a visit! Wow! It's like a cozy B&B, I love it - well done! Thanks for linking up to our Repurpose-Remodel-Reveal linky party! wow on the end tables! !